The Philippines’ headline inflation in October 2018 reached 6.7 percent, still the highest recorded in nine years. It maintained the same rate pegged in the previous month. The increase in prices in areas outside of Metro Manila also maintained the same pace at 6.8 percent, while the increase in prices in Metro Manila slightly slowed down to 6.1 percent from 6.3 percent in September. Among all the commodity groups, the price index for alcoholic beverages and tobacco increased the fastest at 21.6 percent, followed by food and non-alcoholic beverages at 9.4 percent. Though these two groups recorded the fastest increases, they are the only commodities with inflation rates that slowed down compared to the previous month. Prices in the transport sector rose 8.8 percent from eight percent in September. Furnishing, household equipment and routine maintenance of the house follows, with prices increasing to 3.7 percent from 3.5 percent. Other sectors that saw increases in prices in October include housing, water, electricity, gas, and other fuels (4.8 percent), health (4.3 percent), restaurant and miscellaneous goods and services (4.2 percent), and recreation and culture (3.1 percent). Meanwhile, inflation rate in the clothing and footwear, communication, and education sectors remained the same at 2.5 percent, 0.5 percent, and -3.8 percent, respectively. Across the country, the Bicol region still has the highest inflation rate at 9.9 percent, though it has decelerated from 10.1 percent in September. 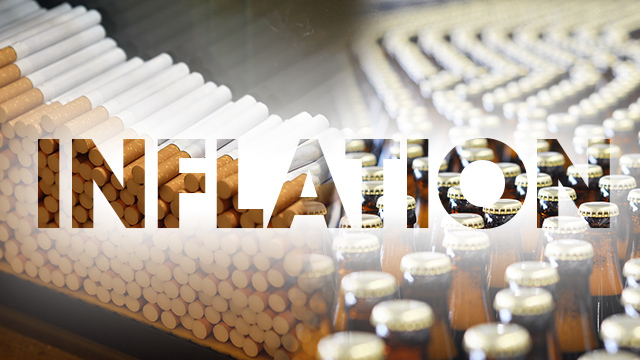 Central Luzon also remains the region with the lowest inflation rate at 4.4 percent.